A golf club, hair straighteners and darts are among the thousands of items seized at Aberdeen Sheriff Court over the past six years. 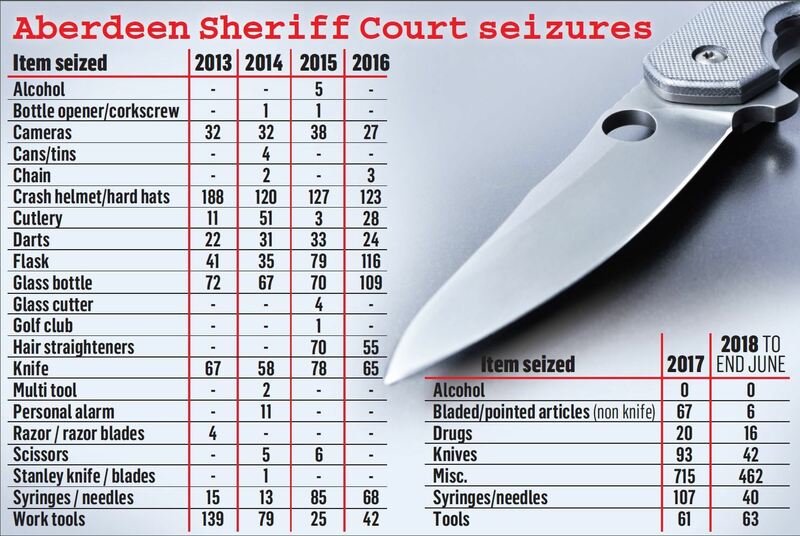 New figures show there were more than 4,082 confiscations of potentially dangerous tools, contraband and more from members of the public since 2013. At least 975 of the seized items would have been eligible for charges under weapon legislation, such as knives, razors, and other sharp or pointed items. One person even took a swing at bringing a golf club into the court building in 2015. Surveillance equipment such as video cameras – which are banned from all Scottish courts to prevent contempt of court – accounted for more than 100 of the items taken from the public. And almost 600 crash helmets or hard hats were confiscated over the same time period for security purposes. Liam Kerr, shadow justice secretary for the Scottish Conservatives said: “Great attention is paid to the number of knives and other more obvious weapons which are illegal to carry anywhere, never mind in a court of law. “And the amount of weaponry going through the doors if Aberdeen is shocking. Common household items which would ordinarily be safe to carry on your person – such as hair straighteners, flasks and work tools – also accounted for hundreds of the confiscations. 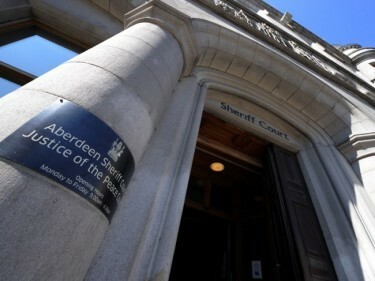 It is thought many people may be unaware of some of the regulations being enforced at Aberdeen and other court buildings across the country. A spokesman for the Scottish Courts and Tribunals Service said: “We work closely with partners, including the police, to take all reasonable precautions against dangerous items being introduced into court buildings. “Any item that is considered to be a potential risk to public safety could be confiscated on entering a court building. “The discovery of any weapon or potential weapon by staff is immediately reported to the police. “Many recorded confiscations are domestic items which people bring to court but are inappropriate to take into a courtroom. The spokesman said the method of recording confiscated items changed at the beginning of 2017 to focus on items that are “clearly prohibitive in nature and a danger to the public”.